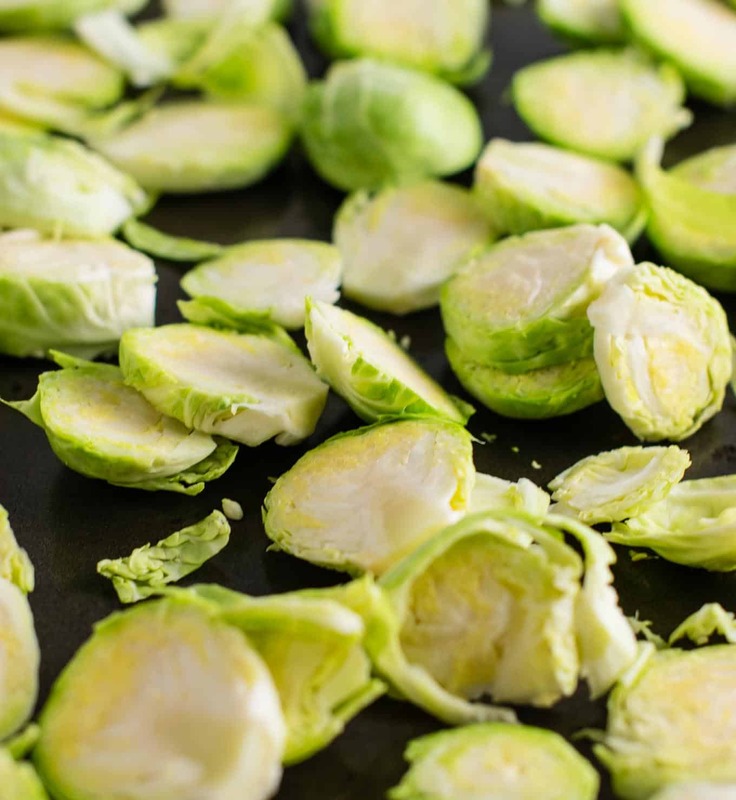 Brussel sprouts – it used to be a “you love them or you hate them” type of vegetable. Well NO MORE my friends. I am boldly stepping out to tell you that these brussel sprouts chips are guaranteed to make anyone who tries them fall in love. They are crispy, cheesy, and salty. So delicious that I would put them on a guilty pleasure food list. Yep, you read that right. 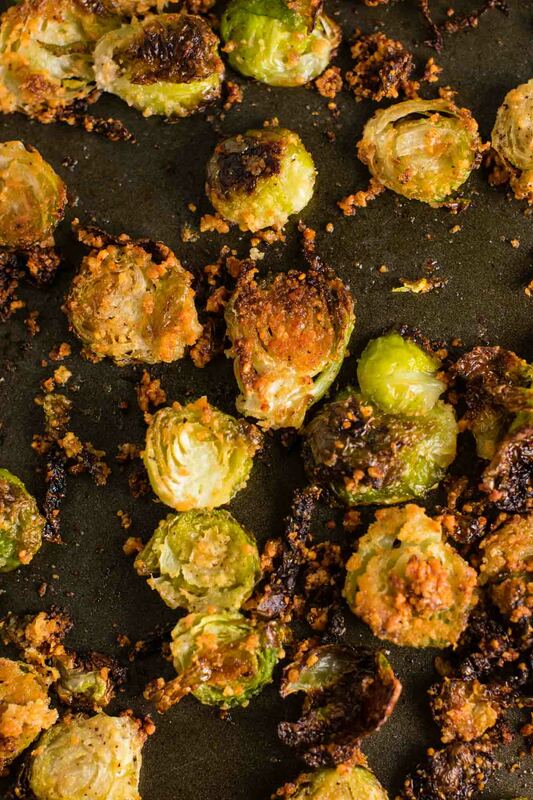 Are you ready to love brussel sprouts? 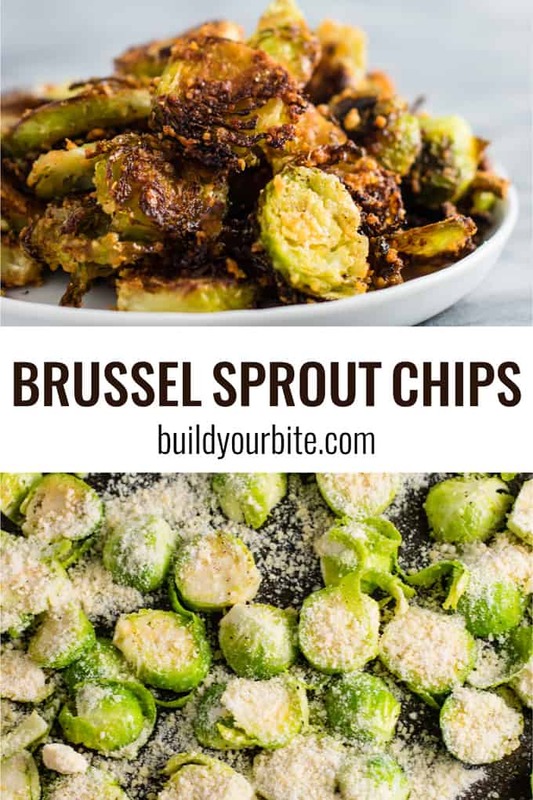 I’m pretty convinced that if you try this recipe, you won’t make another roasted brussel sprout recipe again! After you have cut the ends off your sprouts and removed any outer leaves, it’s time to slice them up. 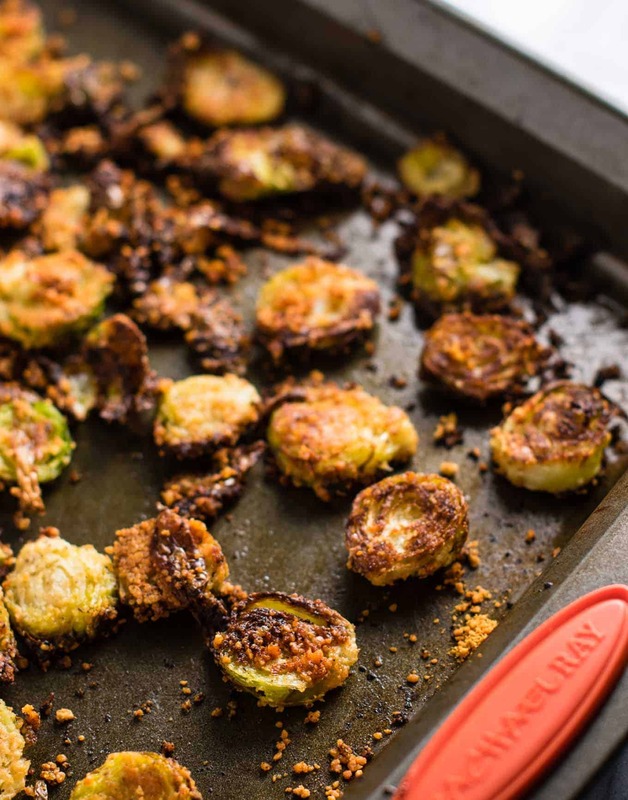 You want them fairly small (this helps them get more crispy), so aim for 3 – 4 slices per brussel. They should look like this. 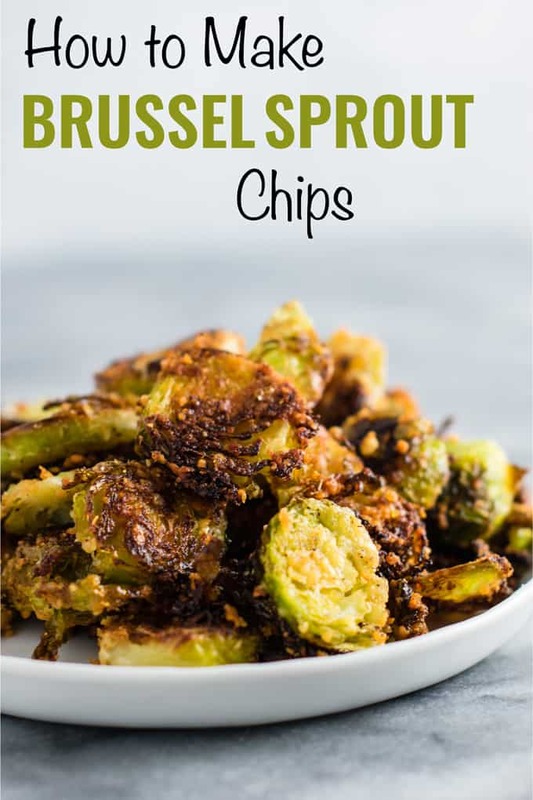 These are called brussel sprout chips after all, so we are going for the thin cut for this recipe. Those thin little slices will be key to getting the crispy edges without a lot of mushy brussel sprouts. 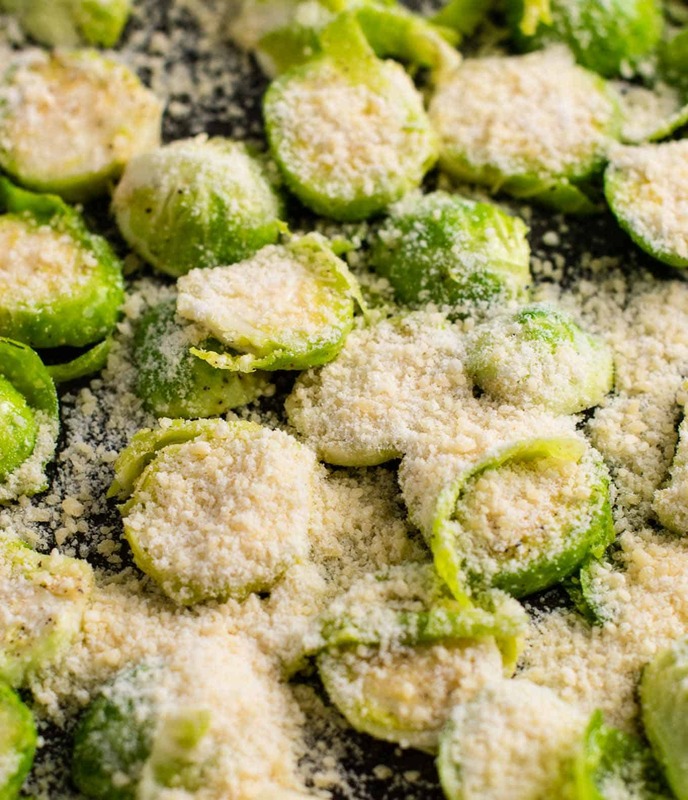 Next, sprinkle on your salt, pepper, onion powder, garlic powder, and parmesan. Drizzle olive oil over the top and toss it all up to coat. 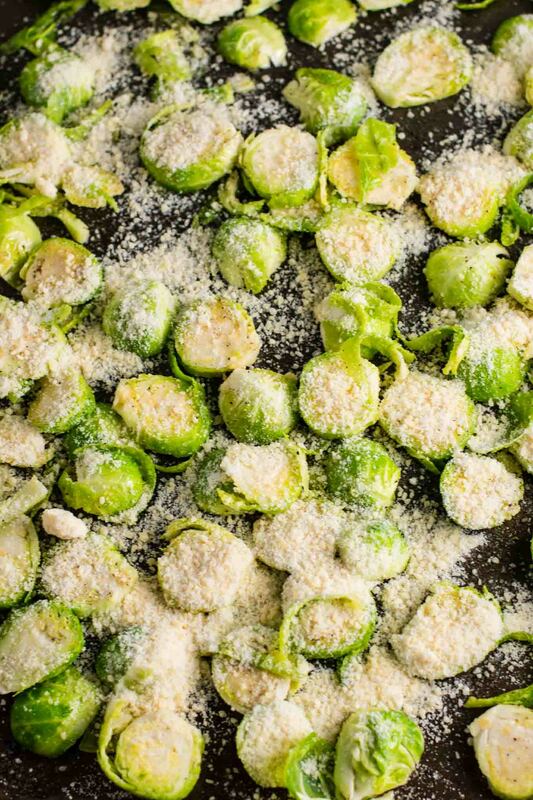 The parmesan adds tons of flavor, as well as a crispy cheese crust to the brussel sprout chips. SO GOOD! 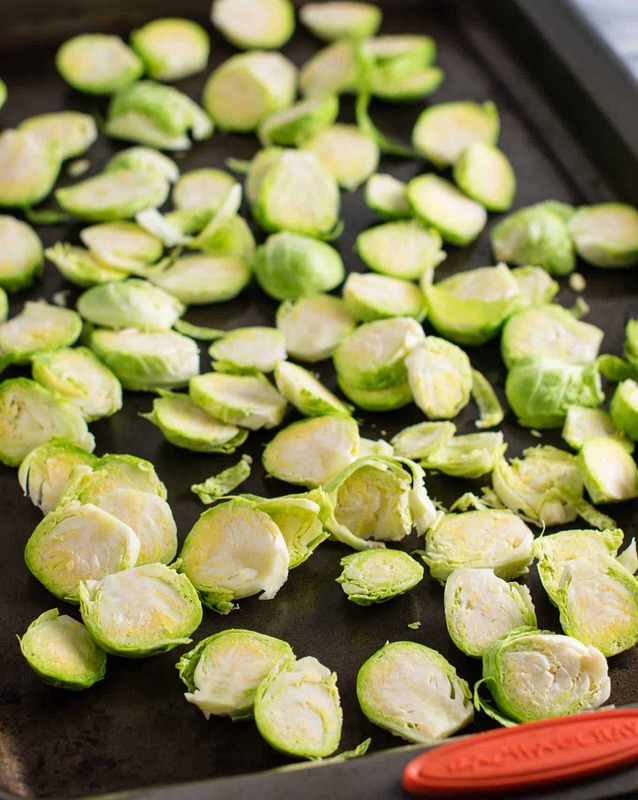 Roast your brussels sprouts chips at 425 degrees for optimal crispiness. I baked mine for 10 minutes, flipped them over, and baked an additional 10 minutes. Depending on your oven you may cook them shorter or longer to your desired level of crispiness. You want them pretty crisp without being burnt. I probably ate ten of these before I could force myself to take pictures. I honestly could have eaten the entire pan by myself, and if I didn’t have to share I definitely would have done it! I have a bag of brussel sprouts in my fridge that are begging to be made into brussel sprout chips. I am planning to make these a regular lunch rotation or dinner side. 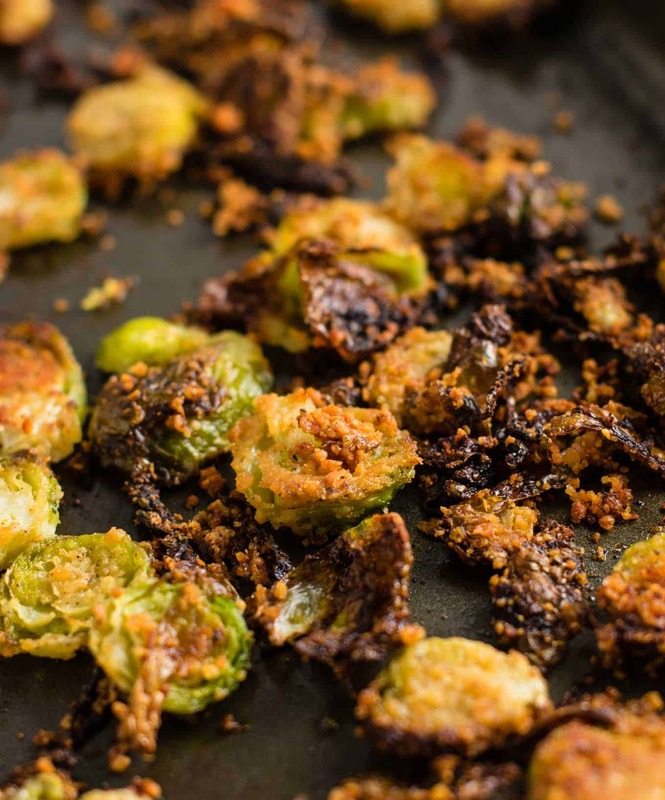 If you have never loved brussel sprouts before, this recipe will definitely change your mind! 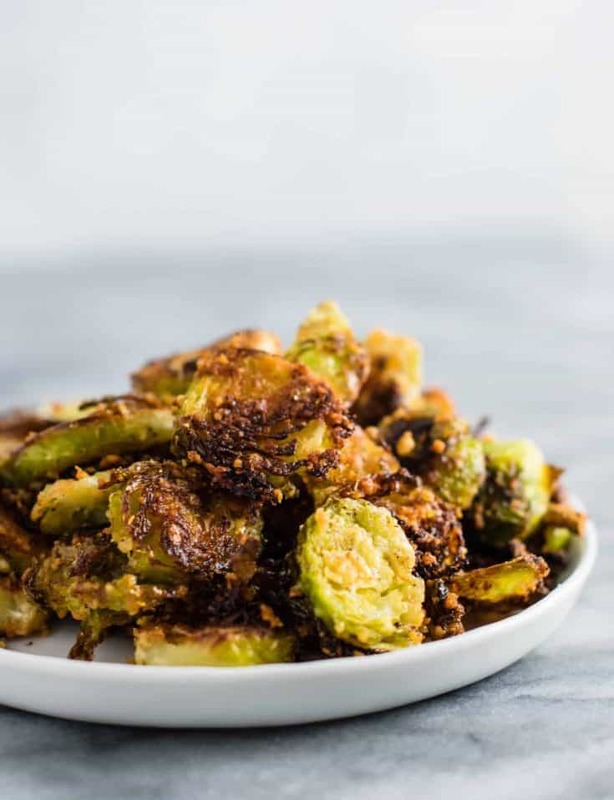 Here are some more easy side dish recipes to get your daily veggies in! Don’t forget to tag me on instagram @buildyourbite and hashtag #buildyourbite with your recipe creations! 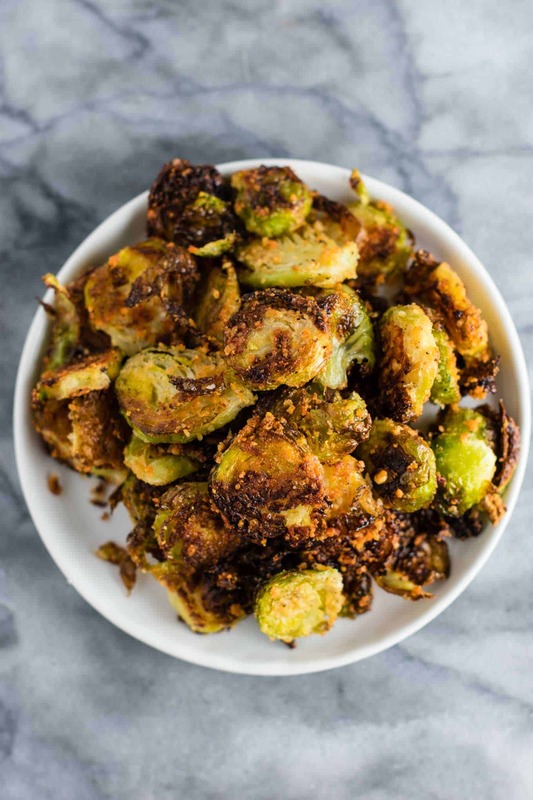 Roasted brussel sprout chips recipe with parmesan cheese and spices. 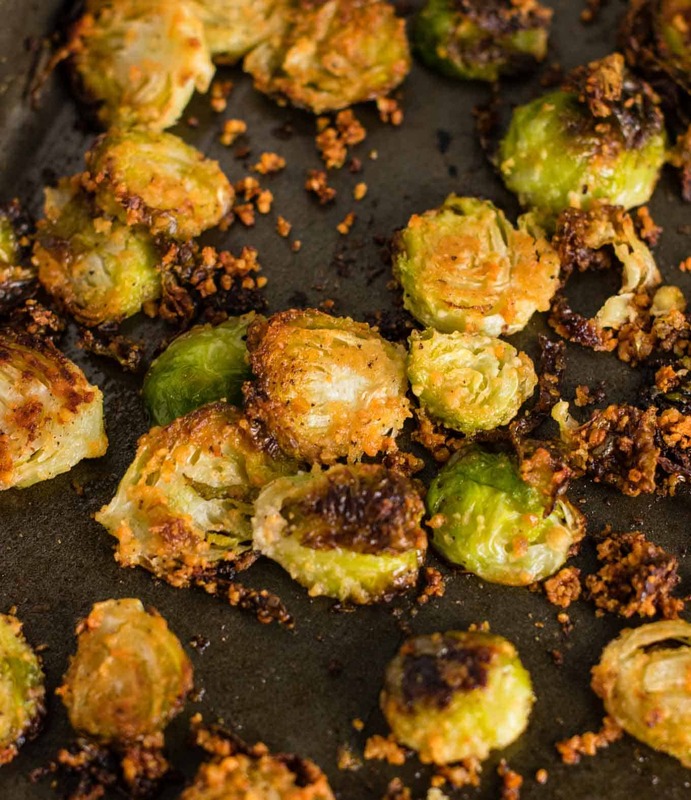 Even brussel sprout haters will love this recipe! These are so addictive, we loved them! WOW! These were delicious! I tossed everything in one bowl. These look delicious. I’m not much of a cook, but I think I can make these. 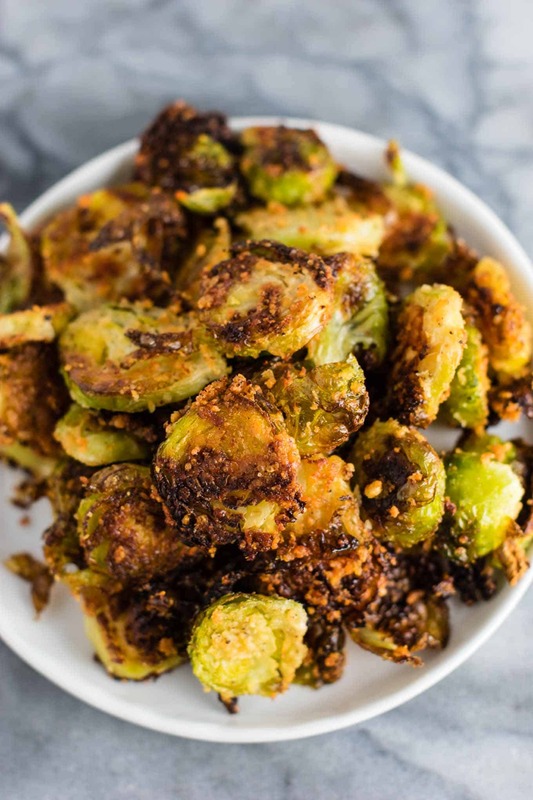 Brussel sprouts are one of my favorites.. I ‘m a relatively new reader, but so far the recipes I’ve tried have been a hit with my family. I’m so glad Sharon. Thanks for being here, and I hope you try making these!